Did you know that a gallon of gasoline produces enough heat to boil over 120 gallons of water! So the two or so gallons of coolant that circulate within your BMW's cooling system have to carry away a lot of heat. According to the U.S. Department of Transportation, cooling system failure is the leading cause of mechanical breakdowns on the highway. Don't let a coolant leak cause damage to your automobile. The certified professional technicians at German Car Specialists, Inc. are trained to efficiently diagnose and repair your BMW's coolant leak. We pride ourselves on being the Eastside's best BMW diagnostic center. Let us make your experience as hassle free as possible. German Car Specialists, Inc. has exclusively serviced German automobiles since 1979. A worn seal on the water pump shaft can leak coolant. Water pump. A bad shaft seal will allow coolant to dribble out of the vent hole just under the water pump pulley shaft. If the water pump is a two-piece unit with a backing plate, the gasket between the housing and back cover may be leaking. The gasket or o-ring that seals the pump to the engine front cover on cover-mounted water pumps can also leak coolant. 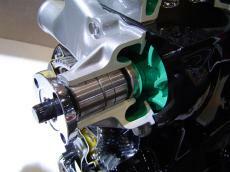 Look for stains, discoloration or liquid coolant on the outside of the water pump or engine. Radiator. Radiators can develop leaks around upper or lower hose connections as a result of vibration. The seams where the core is mated to the end tanks is another place where leaks frequently develop, as is the area where the cooling tubes in the core are connected or soldered to the core headers. The core itself is also vulnerable to stone damage. 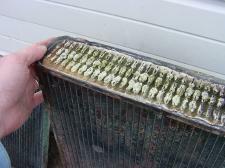 But a major factor in many radiator leaks is internal corrosion that eats away from the inside out. That's why regular coolant flushes and replacing the antifreeze is so important. Pinch hoses to check for age cracks, hardening, soft spots, blisters or bulges. Hoses. 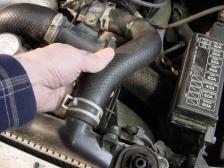 Cracks, pinholes or splits in a radiator hose or heater hose will leak coolant. A hose leak will usually send a stream of hot coolant spraying out of the hose. A corroded hose connection or a loose or damaged hose clamp may also allow coolant to leak from the end of a hose. Sometimes the leak may only occur once the hose gets hot and the pinhole or crack opens up. Freeze plugs (casting plugs or expansion plugs in the sides of the engine block and/or cylinder head). The flat steel plugs can corrode from the inside out, and eventually eat through allowing coolant to leak from the engine. The plugs may be hard to see because they are behind the exhaust manifold, engine mount or other engine accessories. Heater Core. The heater core is located inside the heating ventilation and air conditioning (HVAC) unit under the dash. It is out of sight so you won't see a leak directly. But if the heater core is leaking (or a hose connection to the heater core is leaking), coolant will be seeping out of the bottom of the HVAC unit and dripping on the carpet. Look for stains or wet spots on the bottom of the plastic HVAC case, or on the passenger side floor. Intake Manifold gasket. The gasket that seals the intake manifold to the cylinder heads may leak and allow coolant to enter the intake port, crankcase or dribble down the outside of the engine. These are the worst kind of coolant leaks for two reasons. One is that they are impossible to see because they are hidden inside the engine. The other is that internal coolant leaks can be very expensive to repair. Bad head gasket. Internal coolant leaks are frequently due to a bad head gasket. The head gasket may leak coolant into a cylinder, or into the crankcase. Coolant leaks into the crankcase dilute the oil and can damage the engine's bearings. The repair involves removing the cylinder head to replace the gasket. Head gasket failures are often the result of engine overheating (which may have occurred because of a coolant leak elsewhere in the cooling system, a bad thermostat, or an electric cooling fan not working). When the engine overheats, thermal expansion can crush and damage portions of the head gasket. These damaged areas may then start to leak combustion pressure and/or coolant. A cracked cylinder head can leak coolant inside the engine. Cracked Head or Block. Internal coolant leaks can also occur if the cylinder head or engine block has a crack in a cooling jacket. A combustion chamber leak in the cylinder head or block will leak coolant into the cylinder. This dilutes the oil on the cylinder walls and can damage the piston and rings. If enough coolant leaks into the cylinder (as when the engine is sitting overnight), it may even hydro-lock the engine and prevent it from cranking when you try to start it. A coolant leak into the crankcase is also bad news because it can damage the bearings. Coolant leaking into the crankcase will make the oil level on the dipstick appear to be higher than normal. The oil may also appear frothy, muddy or discolored because of the coolant contamination. Leaky ATF oil cooler. Internal coolant leakage can also occur in the automatic transmission fluid oil cooler inside the radiator. On most vehicles with automatic transmissions, ATF is routed through an oil cooler inside the radiator. If the tubing leaks, coolant can enter the transmission lines, contaminate the fluid and ruin the transmission. Red or brown drops of oil in the coolant would be a symptom of such a leak. Because the oil cooler is inside the radiator, the radiator must be replaced to eliminate the problem. The transmission fluid should also be changed. Another coolant component that sometimes needs attention is the coolant overflow reservoir. The coolant overflow reservoir does more than catch the overflow from the radiator. It's main function is to serve as a storage tank for excess coolant. When the system is hot, coolant will be forced out through the radiator pressure cap and into the reservoir. Then as the system cools down, decreasing pressure will draw coolant back into the radiator. 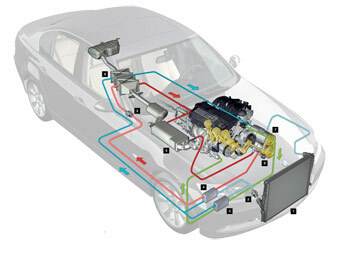 On many newer vehicles, the coolant reservoir is pressurized and is an integral part of the cooling system. The filler cap for the cooling system is located on the reservoir tank, and the tank is connected to the radiator and engine with hoses. The reservoir is transparent plastic and you can see the coolant level inside.If the coolant reservoir is cracked or leaking, the system may lose coolant every time the engine heats up. Eventually, this can cause the engine to overheat.